The Car Illustrated - A Journal of Travel by Land, Sea and Air. Homepage. This page: Review of a very early British motoring magazine. dating the veteran era. "The Car Illustrated" - a magazine from the veteran era. As British car magazines go, this is one of the earliest. It's full title is "THE CAR ILLUSTRATED A Journal of Travel by Land, Sea and Air". A weekly publication, this copy dates to March 11th 1903. Given that it's now over 110 years old, its frail condition can probably be excused. While the cover displays none of the eye-catching graphics and imagery found on later magazine covers, The Car makes up for this with a revealing selection of advertisements that shed light on just a handful of the many many engineering firms that were producing cars, usually in tiny numbers, at the start of the 20th century. Somebody looking for "the handsomest light car" may well have been tempted to contact S.F. Edge Ltd for details regarding the 12hp four-cylinder "Gladiator" car, fitted with a Labourdette body, it "... is constantly surrounded by a crowd of admirers, and has been adjudged by many to be the handsomest light car in the Show". Jean Baptiste Labourdette operated a coachbuilding firm in Paris at the time. 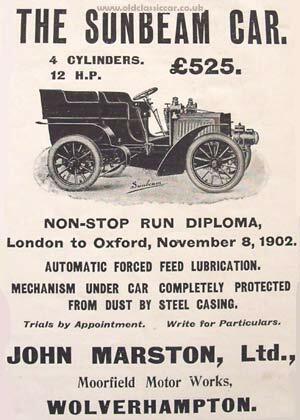 Marques perhaps more familiar to classic car enthusiasts, rather than those of the veteran era, receive a mention thanks to advertisements from Humber and Lanchester, the latter available for inspection at The London Motor Garage Ltd, where the "Magnet" 12hp with tonneau body was also to be discovered. Other veteran-era motor-cars listed on the cover are as follows: De Dion-Bouton, the 12hp four-cylinder Velox Car, and Panhard & Levassor. Dunlop Tyres celebrate C.S. Rolls' speed achievements in reducing the record to cover a flying kilometre to 27 seconds, in so doing reaching a maximum speed of 83 miles per hour. One car I'd definitely not heard of before reading this, is the French "Voiture Pipe". A satisfied owner writes in glowing terms of his tour of Southern France at the wheel of such a machine, indeed "... no mishap or breakdown occurred to mar the pleasure of the journey". Other than being powered by a 15hp engine, and having won a gold medal at Paris in 1902, and Brussels in 1903, no other information is provided. I wonder whether said gent wore an "Aquascutum" Motor Coat, as worn by His Majesty The King, according to a single line ad running down the righthand side of the page. 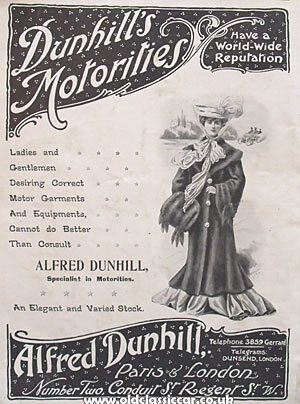 The rear cover bears a full-size advertisement for Dunhill's Motorities, ie motor clothing & accessories - "Ladies and Gentlemen desiring correct motor garments and equipments cannot do better than consult Alfred Dunhill, Specialist in Motorities. Accessories sold by Dunhill's in the 1900s are keenly sought out by London to Brighton drivers and their ilk. 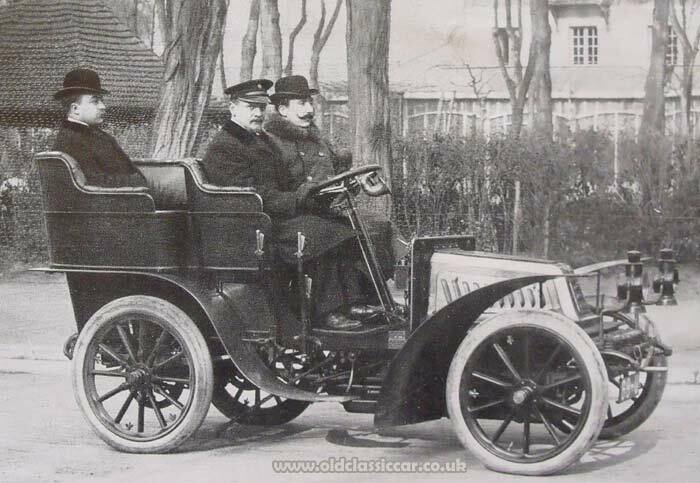 Given that most cars of the era were open-top rather than closed saloons, weather-proof attire was a key consideration for the early motorist. It wouldn't be long before other companies began to offer clothing to the automobilist - one example being Brown Brothers. Cars advertised within the magazine's pages. The content covers a broad church of travel-related interests, from correspondence sent in by readers, to travel-related articles about far-flung destinations, motoring legislation (there was much correspondence regarding the introduction of vehicle identification plates for example), and informative pieces regarding cars that were on the market at the time. Sticking with advertisements for a moment, there are several illustrated ads for fairly obscure makes and models that deserve a mention. 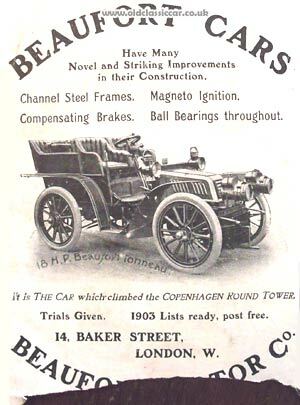 Inside the front cover is a 1/4 page ad for Beaufort Cars, of 14 Baker Street in London. The "many novel and striking improvements in their construction" included the use of channel steel frames, compensating brakes, magneto ignition, and ball bearings throughout. Illustrated is an example of 18hp Beaufort Tonneau, the car which "climbed the Copenhagen Round Tower", a construction completed in 1642 for use as an astronomical observatory. A spiral ramp, rather than stairs, enabled access to its upper deck. Beauforts were German-made, but built for the English market only, not a fact that gets a mention in the ad. The City & Suburban Electric Carriage Co. Page vi is a reminder that not all horse-less carriages of the day were necessarily petrol-fuelled. Steam was still much in evidence, and there were also a number of companies producing electric vehicles. 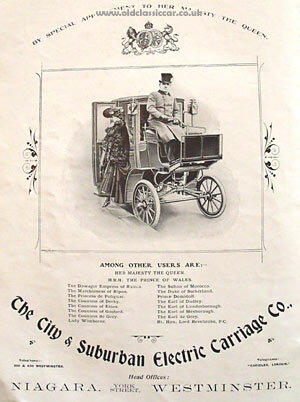 Here, The City & Suburban Electric Carriage Co. wish to draw attention to their vehicles. The reader isn't troubled by the technical specification of such a vehicle, but is given an extensive list of satisfied owners/users. These include Dowager Empress of Russia, the Marchioness of Ripon, a number of Countesses, the Sultan of Morocco, and other high-profile customers. The vehicle was based on the running gear and platform of the Columbia, an American design, fitted with English coachwork to suit local tastes. 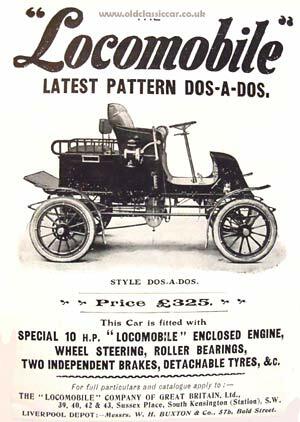 For 1903 The Locomobile Company of Great Britain were proud to share their new dos-a-dos (ie back to back seating) car. This machine is a classic example of why specialist clothing designed for motorists in particular became popular, in fact a necessity, for many new to the pastime. It was supplied with a 10hp engine, wheel steering (instead of a tiller), two brakes, and detachable rims. Priced at 325 GBP it offered economical motoring, even if it wasn't supplied with much (any) weather protection - not even a windscreen. For those looking to spend more on their next motor-car, perhaps the four-cylinder 12hp Sunbeam for 1903 might have been a candidate. With force-fed engine lubrication, and shielding to protect the running gear beneath the body from dust, grime, and various deposits left behind horse-drawn carriages, it would prove to be a popular choice. John Marston Limited, of the Moorfield Motor Works in Wolverhampton, was the supplier. 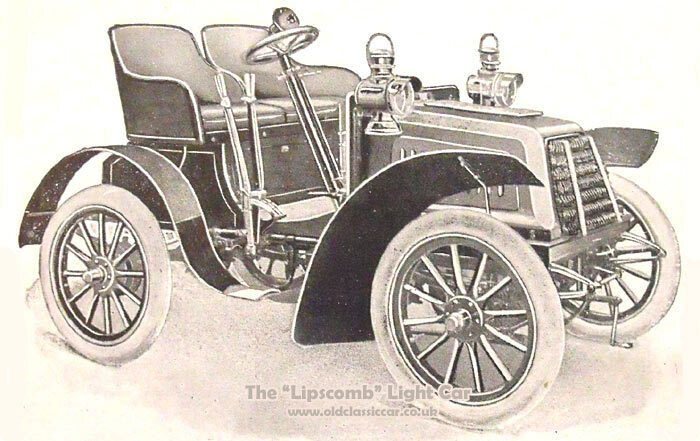 Tucked away, inside the back cover, is an attractive advertisement for the Lipscomb Light Car. Priced at 195 GBP, on face value it offered a lot for the money (a 9hp version with tonneau body is priced at 270 GBP). The buyer of the less expensive car could choose from either 6.5hp De Dion or Aster engine, which would be coupled to a three speed (plus reverse) gearbox. Clipper Continental tyres, fitted to equal size artillery wheels, were standard fitment, as was braking on two of the wheels. Ignition was provided courtesy of "Carburetta" Electric Ignition, while pedestrians and passengers alike would approve of its "most effective" exhaust silencer. It was available to buy from the English Motor Car Company, 3 Hanover Court, Hanover Square, in London. The Brush Electrical Engineering Co. Noted for their "elegance of design and quiet running", electric vehicles are again represented, in this instance those of the The Brush Electrical Engineering Company. No less an individual than the Duke of Westminster agreed to endorse their product, emphasising that he was "most satisfied with his Brush car in every way". Mors, Renault, Gardner-Serpollet (steam), "Vibrationless" Gobron-Brillie, Benz, 24hp Daimler, 3.5hp Gladiator (as on the front cover), 10hp Panhard, 6hp Bardon, Vapomobile Steam Cars, Chenard et Walcker, Mercedes Simplex, Ariel Motor Company, and Thornycroft steam wagon. No doubt there was much anticipation surrounding the outcome of a competition that ran in the magazine from September to December 1902. Not for the winner a mere tin of car polish, or set of rubber mats, no for one lucky individual they'd soon be taking delivery of a shiny new 12hp Gladiator, valued at 400 GBP. The lucky chap was a Mr Lionel Bulteel, of 11 Bruton Street, London W1. Second prize, a choice of either a Humber bicycle or a set of furs, went to Mr H.M. Howell of Llanelly in South Wales, while third prize (camera or furs) was awarded to John Cooper, of Streatham. Other prizes included a motor watch with case, a waterproof motor rug (handy for those chilly rides out), a pair of Strom goggles, and a framed portrait of the King. Previously un-published photographs taken of cars due to compete in the Gordon Bennett race feature on the site here. A number of articles within this issue of The Car make reference to the preparations that were underway, ahead of it taking place. The Gordon Bennett Bill was to be presented shortly to the House of Lords. The hosting of the race in Ireland was seen as a way of further enhancing links between Ireland and Britain, as well as being a golden opportunity to demonstrate the great value of adopting the motor-car to the Irish, given that many had not clapped eyes on such machines before. There were also plans afoot to raise funds in order that the condition of the roads be improved, prior to the race itself. There had also been suggestions put forward in certain quarters that the running of a motor bicycle race, after the main Gordon Bennett car race, would be a good idea, given that the roads would already be closed off. Latest news though was that this wasn't likely to happen, primarily because it was considered to be too great an imposition on the locals, who would already have accommodated considerable disruption to their daily routine, without prolonging it by hosting a second race. The author also points out that "... after a big car race the contest of motor bicycles would be a pigmy and uninteresting affair". Veteran road test of the Georges Richard. 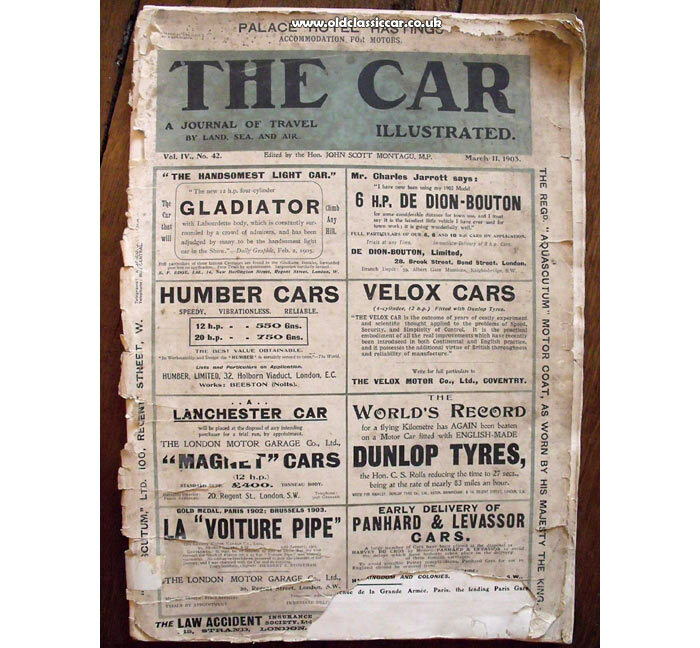 Autocar magazine, or The Autocar as it was then titled, claim to have printed the first road test of a car, an Austin 7, in 1928. This 1903 copy of The Car has what reads very much like a road test in it, discussing the Georges Richard, and I doubt it was the first such piece of this type that they'd run. Three earnest-looking gents are shown sat in a 12hp George Richard, a model that featured a number of improvements - with regard to construction mainly - over the 1902 model. The specification of the car is then discussed in detail, including analysis of its twin-cylinder engine which was similar to the previous year's unit, albeit with slightly enlarged capacity. Another improvement was the replacement of its ignition system, now replaced by a simple magneto installation. The gearbox was now a four-speeder, one more than previously had been the case. Overall, they were very complimentary of its driving manners and controls. 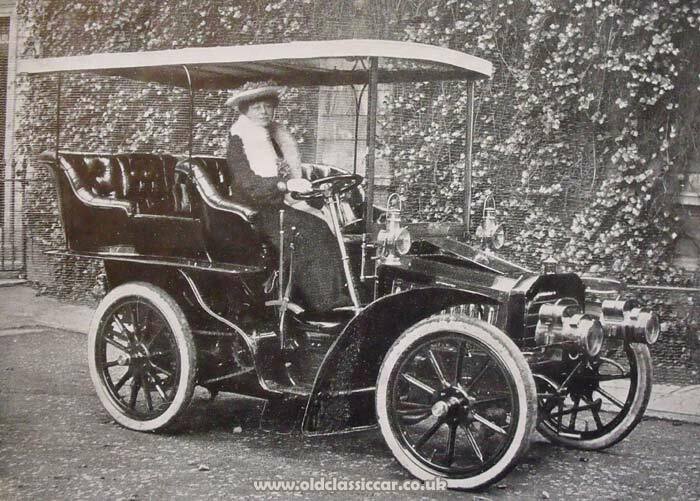 Mrs Thrupp and her 16hp Milnes-Daimler. "Ever since the passing of the Act in 1896, Mr Thrupp has been far sighted enough to realise that the building of bodies for motor-cars would become a huge industry - with the result today that his firm have taken their place in the front rank in this particular trade". Given that this was published weekly, The Car has a good number of interesting articles within its large-format pages. Evidently it had been around for some time, this copy is No.42 of Volume IV. How long did it continue in print - does anyone know?